A worker arrived at our door. He removed the light in the middle of the kitchen ceiling. He crawled up halfway into the ceiling. He took a rag and a bucket as tools on his journey. He returned with a full bucket and a filthy rag. He wiped down the floors in the kitchen and the living room. He advised that I remove my wet towels, which had left a few stripes on the floor. He wiped off the remaining drips from the living room ceiling. 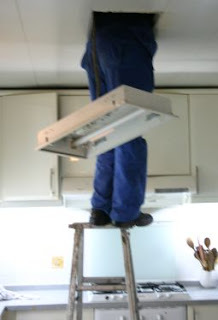 He went to reinstall the light in the kitchen, and I asked him to leave it down. The more air flow in that space, the better, I figure. He worried. He worried that I would bump my head. He worried for our safety. I told him I think it will be okay. Hao de, hao de. He has left. And surprisingly, I do feel a bit better. we felt so bad to read about this . . . is it much better yet? what a nusiance! to say the least!